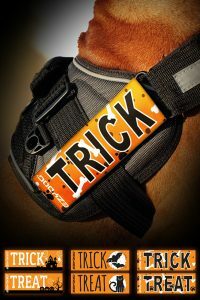 Convert Dog Harness with Halloween Trick or Treat Badges. T he Convert Harness is one of our favorites – it’s a versatile, functional and high-quality dog harness made to fit any size dog. One of the great features of the Convert Dog Harness is the ability to add pre-made or custom side badges to it – one for each side. For Halloween, we’ve just launched a series of “Trick-or-Treat” badges (3 different styles – see image for details) that will give your dog that “Halloween flair” while you’re out trick-or-treating, without the distraction or danger of a costume. The badges attach with velcro – so after Halloween, you can simply pull them off and go back to a different set of badges. Even better – through Oct 31 of 2017, you can get a free set of Halloween Badges when you order a Convert Harness – just use code “trickortreat” when you check out! Knowing you’ll be out after dark, ensuring that you can find your pooch if they get away from you will be critical – especially knowing the amount of traffic (both foot and car) that will be out that night. 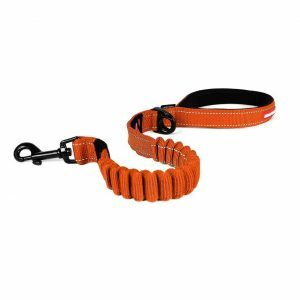 Attaching an Adventure Dog Collar Light to your dog’s collar or harness will ensure that they have a bright shining beacon on them that is waterproof and can be seen for up to 3 miles. Zero Shock Leash. With all the ghosts and ghouls and vampires out and about on Halloween, you can forgive even the best-behaved pooch for being a little jumpy. 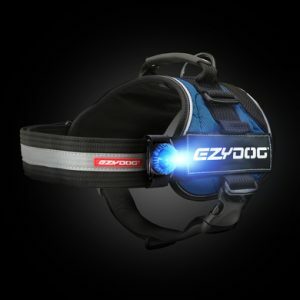 Using an EzyDog Zero Shock Dog Leash will make sure those jumps and pulls don’t create a shock-wave up to your arm, keeping you both safer and happy. Have a great time out there and be safe! Happy Halloween from EzyDog.